the picture above was in my treasure box of old family photos. once again there was no notation on the back indicating anything about the picture - absolutely no information about where, when, or who took the picture. all I know is someone in my family took the picture and over the years it ended up in my possession. I found myself intrigued by the picture* - the fashion, the cars, the architecture, and the people. all frozen in time but also all a mystery. 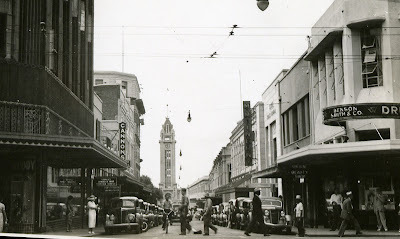 based on the style of the cars and the clothes the picture appears to have been taken in the 1940s, but where? was it new york? but I don't think it looks like new york - not tall enough; and it doesn't look like any of the cities near the towns in which my family members lived. I thought the tower looked familiar, but there are towers scattered all over the place. central clock towers are a common architectural feature in many cities. one weekend when I had some time to play, I thought I'd investigate. 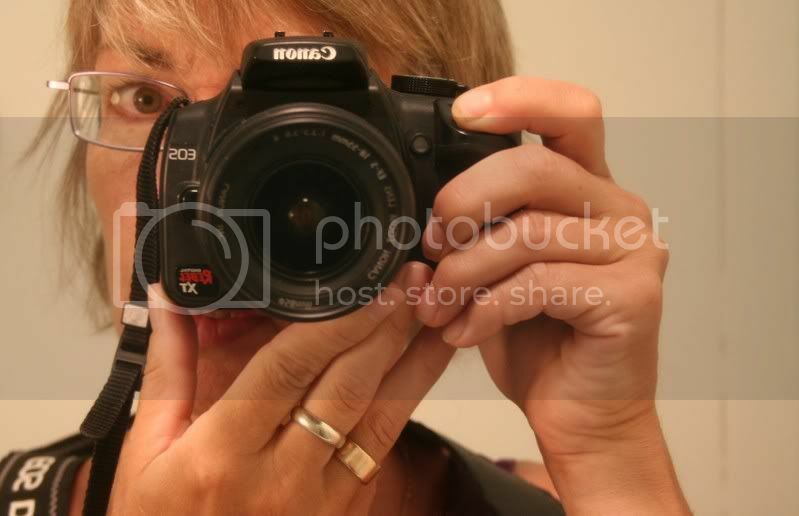 I knew I couldn't find out who took the picture or exactly when it was taken; however, I figured there were enough clues in the picture to at least find out where the picture was taken. the biggest clue was the benson and smith drug store, if I could find out where that was I could probably locate where the picture was taken. so I googled 'benson and smith drug store' and voilà in less than a minute I discovered that this picture was probably taken in honolulu. 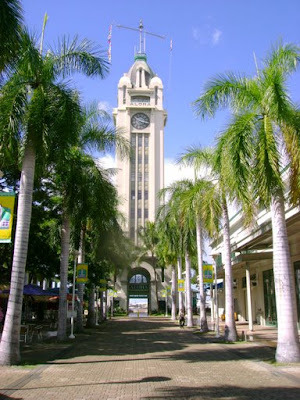 to confirm that I next did an image search for honolulu clock tower yes it was most definitely taken in honolulu! still a lot of questions left but it's interesting to at least nail down the location. I wonder if the picture was taken "before or after" the day of infamy? anyone out there good identifying cars? the now picture I snagged from google images and I should credit the photographer whose name is alejandra. so thanks alejandra, whoever you are, you helped me solve a little mystery. my time travel and detective work brings to mind the then and now series of books published by thunder bay press. 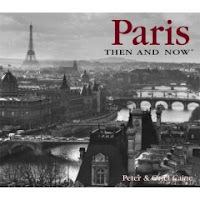 we only have one of the series - the one for paris which was given to me by friends a few years ago to mark and celebrate my first trip to paris. however, I've seen and leafed through a couple other cities in the series and they are quite fun. one day perhaps I'll add the one for cleveland. My guess, based solely on the complete lack of military personnel, is that it is a pre-War photo, possibly even late '30s. The lady's hat and some of the other clothing worn also has a late-'30s feel to me, but I'm no expert and will cheerfully own up to being wrong if someone with some actual information happens by. I'd agree with Len that it's probably late 1930s, but then I'm no expert on fashion on Hawaii of that time period. Also the man on the right with white shoes looks definitely pre-WWII. Can anyone imagine life without google anymore? One of our new best friends. An award awaits you at my blog. no help on dating that photo i'm afraid - but how great! congrats on locating it. "Those cars look like they were from the late 30's cause we had a 39 Plymouth and it sort of looked newer than those on the picture. I never heard of that drug store name either. Where or where do you get these old pictures?????" anon - I can't imagine! dd - I'll be over soon. thanks! let - I just love these old family photos I just wish my some of my ancestors were a bit more compulsive about marking them for prosperity! although I should talk, I fear I'm the same way! There is an identical photo for sale on ebay dated 1934. I just posted a comment about the date. Benson & Smith was located on the corner of Fort and Hotel Streets.